Over the past 30 years, storms, hurricanes and flooding associated with climate change and climate variability have had devastating impacts on Caribbean people, their property and livelihoods, and on the social and economic development of our region. 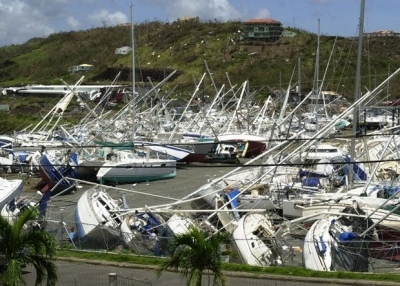 As noted in a recent public address delivered by Milton Haughton, the Executive Director of the Caribbean Regional Fisheries Mechanism (CRFM), "Fishers and fishing communities, in coastal areas are particularly vulnerable to natural disasters especially the storms and hurricanes during the hurricane season each year." The hurricane season opened last month and will run through to November, and fishers and fishing communities, in coastal areas are particularly vulnerable to natural disasters especially the storms and hurricanes duringthis time of the year. It is in this context that Haughton highlighted an initiative to reduce risk to the fisheries sector in the Caribbean. This is the provision of Risk Insurance for fishers. "Since 2015, United States Department of State has been partnering with the World Bank, CRFM, the Caribbean Catastrophe Risk Insurance Facility (CCRIF), CNFO, and others to develop a parametric insurance product to be implemented by Caribbean governments to promote the resilience of their fisheries sector against the peril of increasing climate-change related disaster risk," he explained. According to the CRFM Executive Director, the insurance policy would be structured in a way to provide incentive for governments to promote and implement international best practices in fisheries management and a disaster risk management, but before they purchase the policy, countries would be evaluated to determine how well they are doing in implementing these best practices. "For example, Countries with good fisheries management systems and disaster risk management plans in place for the fisheries sector would pay lower premiums and receive higher payouts if there is a disaster. Payouts would be made by the insurance facility when the agreed trigger event has occurred," he explained, adding that funds would be used to help with the rehabilitation and reconstruction of the fisheries sector. "The CCRIF is also in the process of developing a micro-insurance policy for low income persons in the fisheries in the region. This is called the Livelihood Protection Policy (LPP)--designed to protect low-income people against extreme weather risks," Haughton said. This policy, he explained, will be available through existing insurers. "The LPP is being customized for small-scale fishers and small aquaculture operators in the region with the intention to cover losses to livelihoods caused by storms, heavy rainfall, high winds and other climate related variables. The policy will provide quick payouts to enable fishers and fish farmers to recover more quickly after a damaging event," Haughton announced.